Some unsuspecting kids thought they could beat their coach in a race at a recent summer camp. The challenge sparked the competitive side of Allexis Menghini, a senior on Washburn’s track and field team. 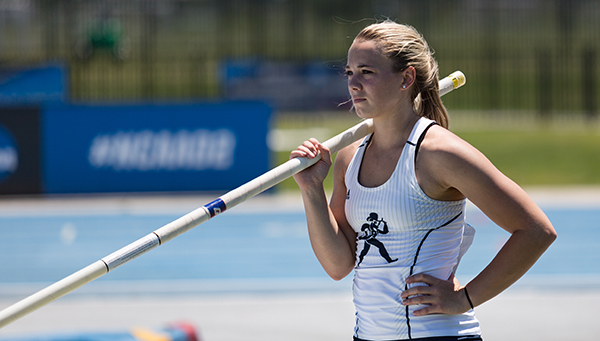 Menghini was the team’s only female pole vaulter last year, the first year of track and field at Washburn since discontinuing it in the 1980s. She qualified for the NCAA indoor and outdoor meets and she’s looking forward to having some fellow vaulters on this year’s team with a new crop of recruits. It takes a certain type of athlete to pole vault. To get a running start carrying a pole more than twice your body length, plant it in the ground and use momentum to carry you upward. As the pole bends and springs you forward and further up, you let go as your body rotates 180 degrees and you clear a bar feet first and fall safely to a mat. Perhaps just as important as athleticism is the mentality to master the variables, ignore fear and focus on your vault. Menghini grew up in Lincoln, Nebraska, and dreamed of being a gymnast at the University of Nebraska. However, when she turned 12, her family moved to North Platte, Nebraska, where the sport wasn’t as prominent. “People recommended pole vaulting since it’s the same upper body strength and body awareness,” she said. She took the advice and was a two-time state champion at North Platte High School. 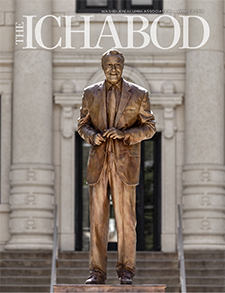 She went to Nebraska and vaulted for two years before transferring to Washburn. Rick Attig, Washburn’s assistant coach, had worked with Menghini at camps throughout the region, and Menghini knew she could improve under Attig’s guidance. “He’s coached Olympians and American record-holding pole vaulters. Everywhere I go with him, he’s a superstar in the track world,” she said. Menghini set a school record in the final outdoor event of the season with a vault of 12 feet and 6.75 inches. That height qualified her for the NCAA national meet in Bradenton, Florida, where vaulters got three chances to clear a height and then move the bar up. She finished 18th with a vault of 11-10.75. As a senior, she’ll also practice her leadership skills, something she will use in her future career in coaching or child therapy. She’s a psychology major and Spanish minor. As long as they don’t challenge her to a race.